The mirror test is a famous test that is used to investigate the child’s concept of self. A mark is put on a child’s nose. 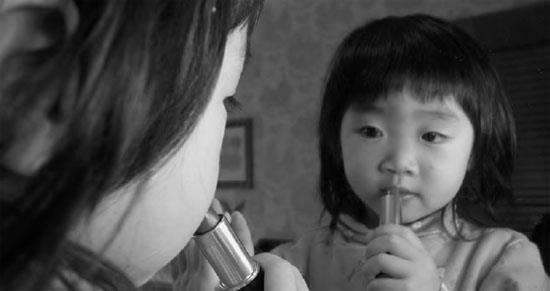 When the child is put in front of a mirror, he or she will either touch the reflected marking in the mirror image, or will touch the actual marking on his or her own nose. Children who touch their own nose recognize the image in the mirror as their own reflection. Most children can pass this test by eighteen months. Interestingly, the mirror test has also been conducted on several species of great apes. Only a fraction of chimpanzees, orangutans, or gorillas pass the mirror test, even as adults. In general, chimpanzees appear to do better than the other ape species on this test. The mirror test tells us about the development of the child’s concept of the self. In the first year, babies do not recognize themselves in the mirror image. A baby is interested in the mirror but does not relate the reflection to the self. In contrast an older child is well aware that the image in the mirror is her own reflection (iStock).